Under the leadership of 2017-2018 NACo President Roy Charles Brooks, NACo is embarking on an initiative in 2017 and 2018 that focuses on the critical role counties play in breaking multi-generational cycles of poverty, especially with our children. More than 43 million people, or 13 percent of the U.S. population, live below the poverty line. Poverty plagues children more than any other age group. Nearly one in five children lives in poverty. A majority of counties have poverty rates between 20 and 58 percent for school-age children. The effects of poverty can be long-lasting. Adverse childhood experiences go hand in hand with poverty and can impact infants for the rest of their lives. The initiative puts a spotlight on age zero to three early childhood development. When we make investments and demonstrate leadership in early childhood development, we will lower future costs in health, child welfare, public safety and justice services. This initiative builds on NACo’s efforts, including addressing the crisis of incarcerating those suffering from mental illnesses and substance abuse disorders, especially with the opioid epidemic. Additionally, we continue to face economic, social and community impacts from the Great Recession, as well as economic dislocations from manufacturing plant closures, shifts in natural resource economies like timber, coal and even agriculture. Individuals and families are often the victims of economic progress. This initiative will build on counties’ significant strides to address the many faces of poverty in America. We are helping our residents overcome adversity and thrive. Just as our residents overcome adversity every day, so too do counties overcome countless challenges to build stronger communities. “Counties Addressing Poverty: Serving the Underserved” describes the critical county role in breaking multigenerational cycles of poverty. 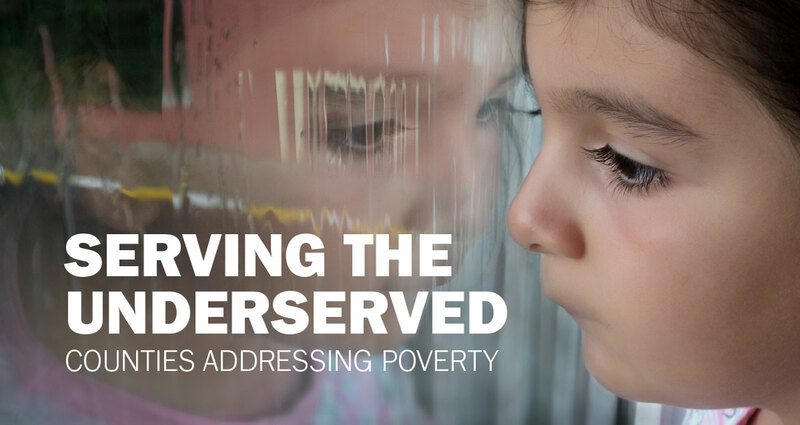 The report examines varying poverty rates across our nation’s counties, county anti-poverty efforts and federal economic opportunity programs that are county-administered. Enrich the public’s understanding of county government. Healthy, safe and vibrant counties across America.